The Old Cider House is a stone-built cottage located in the village of Prestbury in Gloucestershire. Sleeps 2 in a double bedroom with ensuite shower room. Renovated to a high standard throughout and maintaining many original features, the property has a kitchen, cloakroom and living/dining area on the ground floor. The patio is the perfect place for al fresco dining and there's off road parking. With equestrian activities and country walks on site, yet just 5 minutes from all the buzz of Cheltenham, the Old Cider House is the perfect rural retreat with no compromise on comfort and is ideal for horse lovers. Amenities: Central heating with electric woodburner-effect stove. Gas hob, electric oven, microwave, fridge, TV with Freeview, WiFi. Bed linen and towels inc. in rent. Off road parking for 1 car. Patio garden with furniture. Sorry, no pets and no smoking. Shops and pubs 10 mins walk. Note: Adults only. Town: The village of Prestbury is on the edge of Cheltenham, surrounded by Gloucestershire countryside. The village offers amenities including a shop and a Post Office, pubs and a butcher. Prestbury Park, home to Cheltenham Racecouse, is below the Cotswold Hills and plays host to horse races throughout the year. This town boasts Georgian architecture and a range of shops, cinemas, theatres, restaurants, pubs and attractions. Other festivals here include literature, jazz, science, cricket, food and drink and comedy. 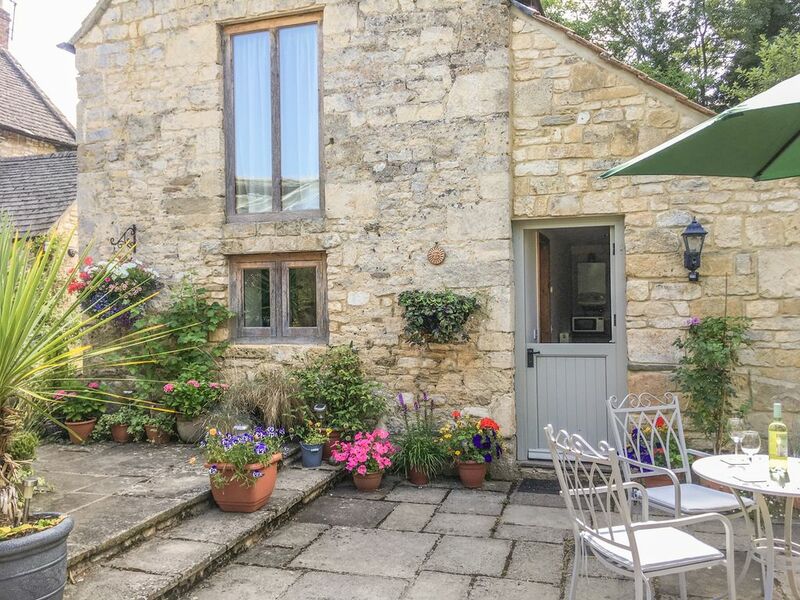 The area offers walks and bridleways, with the Cotswold Way within reach. Try your hand at polo at the Longdole Polo Club. The city of Gloucester offers Roman foundations, Victorian Docklands, a Norman cathedral and a bustling city centre. Many towns and villages lie to the east, whilst to the west lies the Royal Forest of Dean and the Slimbridge Wetland Centre. The city of Bath, Shakespeare's birthplace of Stratford-upon-Avon and Warwick are all within an hours drive, making it the perfect base for a holiday exploring the Cotswolds. 1 double bedroom with en-suite shower, basin and WC. Ground floor basin and WC. Kitchen. Sitting room with dining area and electric woodburner-effect stove. Central heating with electric woodburner-effect stove. Gas hob, electric oven, microwave, fridge, TV with Freeview, WiFi. Bed linen and towels inc. in rent. Off road parking for 1 car. Patio garden with furniture. Sorry, no pets and no smoking. Shops and pubs 10 mins walk. Note: Adults only.